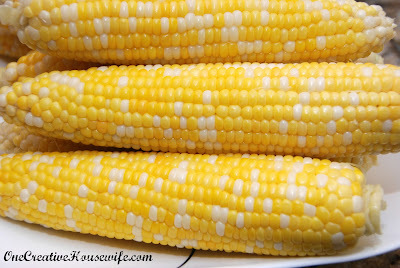 My kids L-O-V-E corn on the cob, but I hate to husk it. Normally I husk the corn, pick off all the tiny hair of silk left behind, and then boil the ears of corn for 7-10 minutes. The longest messiest part of that process is the husking. This year I was determined to find something that was less tedious. The first method I tried was baking the corn in the oven. I preheated my oven to 350 degrees. Then I placed 8 ears of corn (husk and all) on a cookie sheet and popped them in the oven for 25 minutes. I saved the other 4 ears of corn for experiment 2. 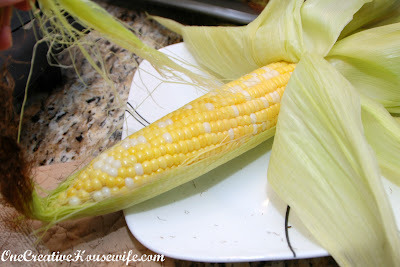 Once the ears of corn were done cooking I let them cool for about 5 minutes, and then I husked them. Look at how easily the silk comes off!!!! This was the easiest husking corn has even been!!!! I just grabbed the top with both hands and pulled. Amazingly everything came off in one try!!! Plus the "stalk part" (technical term, of course) broke off super easy!!!! At that moment I had flashbacks to all of the times I have spent husking corn, and all I could think about is how much time I have wasted. Sure this many take longer to cook, but while it is baking I can make the rest of dinner. As a bonus the ears stay warm longer in their husks, so if you are serving a large group of people this would be perfect! When we tasted the corn it was so juicy and sweet. You didn't even need to add butter. Absolutely delicious! The second method I tired was cooking the corn in the microwave. 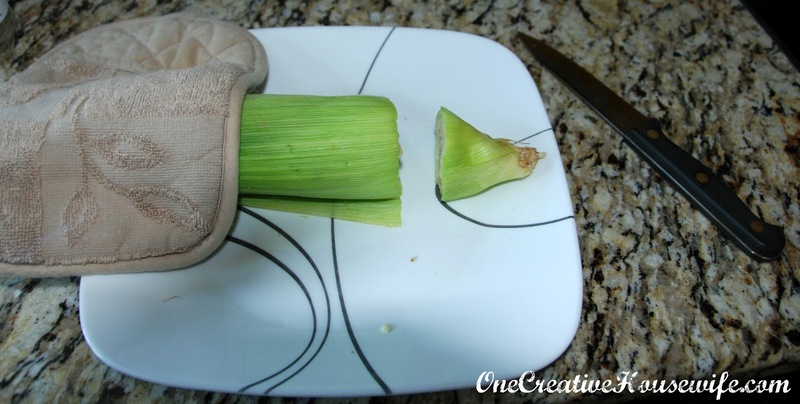 I took the remaining 4 ears of corn and placed them on a microwavable plate (husks in all). I placed them in the microwave (2 at a time) and cooked them for 4 minutes on high. 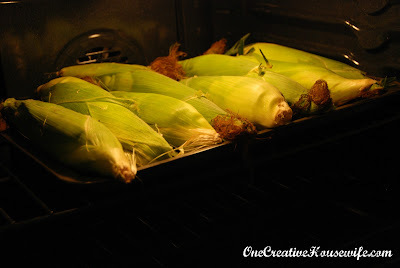 Once the ears of corn were done cooking I let them cool for about 5 minutes. Then I held an ear of corn with a hot pat and cut the end off. At this point you are suppose to be able to squeeze the corn out of the husk. That didn't happen for me, so I just tugged at the top and it came off pretty clean (not as clean as the oven method). Taste wise is was good. Texture wise it was ok, but after trying an ear of corn out of the oven there was no comparison. The oven method is definitely going to stick in this house. If you only had to cook 1 ear of corn the microwave method would be an ok solution. 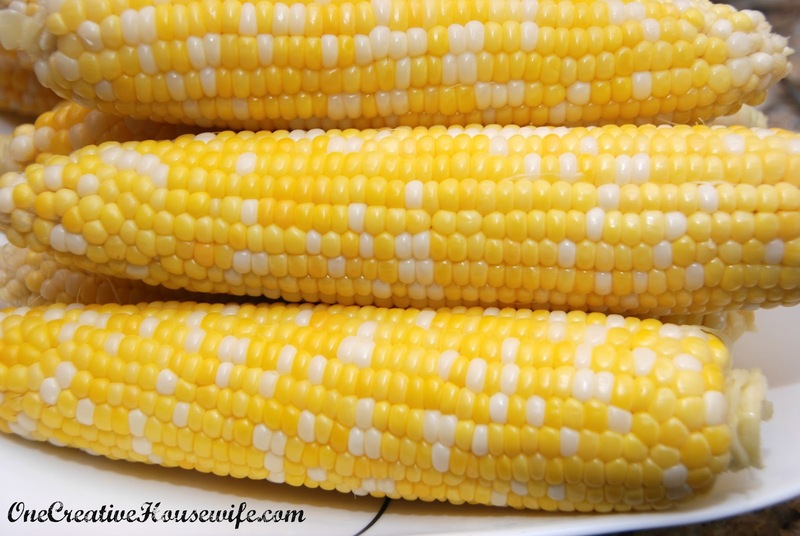 However, if I were cooking just 1 ear of corn, I would still do it in the oven because the taste and texture of the corn are totally worth it.